For those of us lucky enough to reside in snow territory, the mittens, gloves, hats dilemma descends upon us annually. We need them every time we leave the house and we want the mountain of them to be kept in a convenient location, out of sight or at least neatly stashed. It never happens. One of my current design challenges is finding a new solution to the situation and I have some ideas but first I'll show you various solutions we have tried in the past. 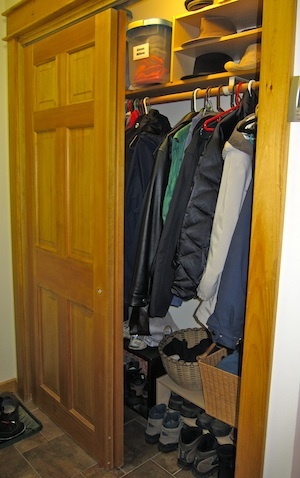 We built a new entry and have a wonderful coat closet there but it has sliding doors. We currently have a couple of baskets - one for gloves and mittens and one for hats on a low shelf in the closet. Neat and out of site. We never use it. The gloves get left on the boot bench. My previous coat closet was in an inconvenient location but it did have a swing door. 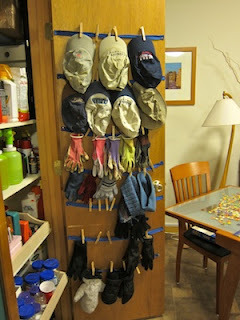 I attached rows of grosgrain ribbon with a staple gun, added clothes pins and we had storage for many gloves and hats. This system was a wonderful solution for years. One of the benefits was wet accessories would dry while hanging there. In reality the kids never put their mittens on it but I would and things would be tidy. I would use this system again if the location were right but the closet has been repurposed as a tool closet. I do recommend it for those that have a swing door. It has been the system that stored the most in a way that was easy to see. It was also very inexpensive to implement. 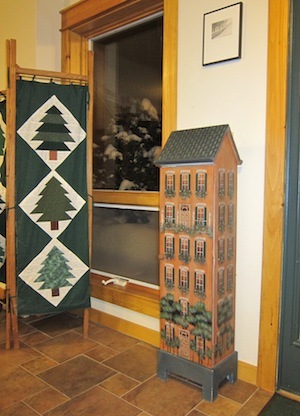 Years ago one of my collections was little houses and I purchased this one at the Christmas Tree Shop. I don't think it cost more than $20. You know the ditty - "Everyone loves a bargain!". The door opens and gloves and mittens live inside. 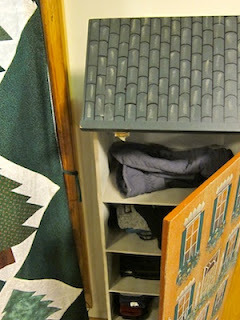 It just doesn't have enough space and I have outgrown both its size and its cutesy exterior. 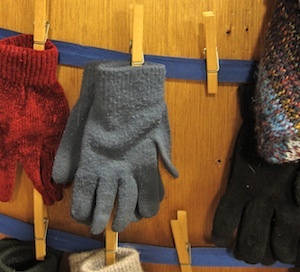 So my design challenge is a new solution to the mittens, gloves and hats dilemma. I'll keep you posted on my progress and appreciate any ideas. I am leaning toward funky, DIY, and colorful. I was inspired by the post on Apartment Therapy today about creative storage solutions. 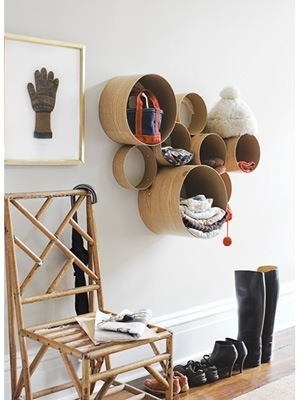 I especially liked the circular shelf unit from the DYI book Home from the Hardware Store. The comments indicated many people want a solution that hides the clutter, not organizes it in the open. My years of experience with mitten mountains makes me agree. But I may very well use this idea for a different display. And I think I might buy the book.